The lament of many American parents -- particularly those of us who work -- is that we don't see enough of our kids. So why separate during vacation? Of course, some time away from the kids is important for reenergizing -- and kids shouldn't be part of more "grown up" cruise activities, like barhopping, casino action or late-night discos. And no one wants to deny their kids access to the fun activities and friend-making of the outstanding cruise line kids clubs. But cruise lines do offer activities for parents and kids to participate in together, and there can be great joy in the experience. Mega-lines Disney, Royal Caribbean, Norwegian, Princess and Carnival are still nautical miles ahead of the pack in terms of programming fun cruises for families. Of course, the challenge for the cruise lines is to find the right balance of age-specific activities and choices with broad appeal. It's relatively easy to develop activities that appeal to a narrow band of ages (e.g., the toddler set or teens). But it can be a tricky business to try to excite youth sensibilities and energy levels without infantilizing the adults -- or, conversely, to keep the adults engaged but not bore the kids silly. Are there specific programs for families (as opposed to just kids)? What are they? Are children welcome at traditional "grown up" activities? Kids might like cooking demonstrations, afternoon tea, bingo or evening cabaret or magic shows. Just make sure you understand what's appropriate to attend with the little ones. Can parents get involved in kid zones and kid-designated activities? Some cruise lines specifically restrict parents from entering areas where the children's programming takes place; others require parental supervision (usually for the under-3 set) and still others invite parents at specified times or for specific programs. It's a good idea to check the policy before booking to avoid separation anxieties (your child's or your own). Which shore excursions are appropriate for kids and/or families? Shore excursions can present a special challenge for families. Parents fret about whether to leave the kids onboard in kid-specific programming or bring them along for shore excursions with fingers crossed that energy levels and patience will hold out. Some lines have developed family-themed shore adventures; Disney is the winner in this department, but other lines do offer family-friendly options in select ports. 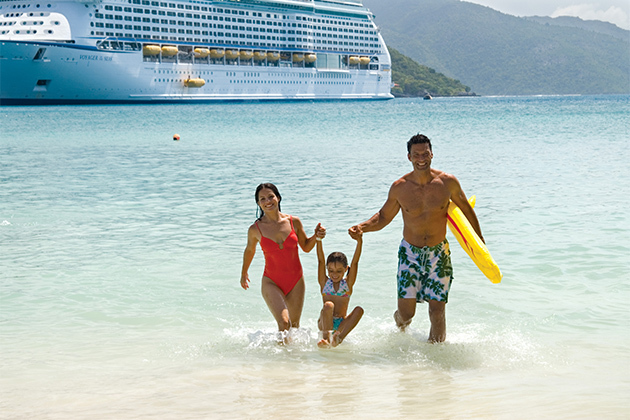 Ready to start planning your next fun family cruise? To kick-start your deliberations, we've rounded up some examples of how cruise lines are introducing new activities (or recasting existing ones) to appeal not only to specific age brackets, but also across them. This is far from new terrain for Disney -- family-friendly cruising is why the line was created in the first place. By bringing many of Disney's theme park sensibilities (including the classic characters) to the high seas, Disney has hit its intended audience square on and sparked a revolution in the family cruise market. 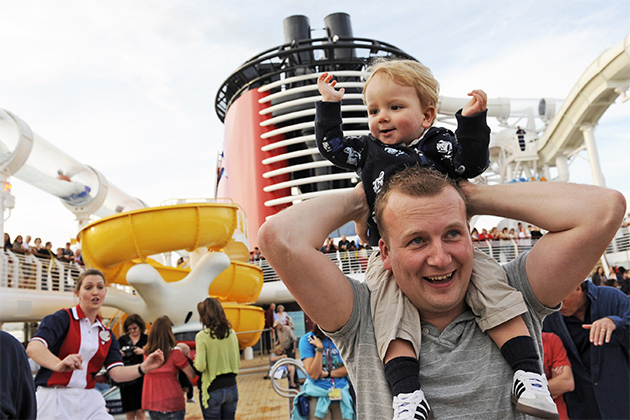 All of Disney's ships -- Disney Dream, Disney Magic, Disney Wonder and Disney Fantasy -- offer extensive family programming. Disney's themed deck parties are family extravaganzas with costumes, dancing and fireworks. The Pirate Night celebration includes stunt performers rappelling from the ship's funnel, music and choreographed pirate battles and kids and adults alike dress up like pirates. Disney's Broadway-style musicals like "Aladdin" and "Toy Story" appeal to even the youngest travelers. The ships' Studio Sea (on Wonder) and D Lounge (on Magic, Dream and Fantasy) are hubs for family entertainment like audience participation game shows, trivia contests, karaoke nights and dance parties featuring special appearances by Disney characters. Other onboard activities include animation classes, where families can learn how to draw Disney characters, magic lessons, tea parties and cooking classes. On a sea day, stop by the Midship Detective Agency (on Dream and Fantasy) and take part in an interactive scavenger hunt with the family. Character breakfasts are a great opportunity for kids (and adults) to meet their favorite Disney friends and get pictures and autographs. Disney's private Caribbean island, Castaway Cay, offers families countless opportunities to explore together on bikes, kayaks, stand-up paddleboards and boats. Families can enjoy a game of mini-golf, Ping-Pong or basketball on the Sports Deck, or catch a 3D movie in the Buena Vista Theatre. The AquaDuck water slide on Disney Dream and Fantasy and AquaDunk on Disney Magic are great fun for kids (and grown-ups) of all ages. Funnel Vision, a jumbo LED screen on Deck 9 shows movies and sporting events outdoors by the Goofy pool. Disney also allows children ages 13 to 17 to get spa treatments off a special kids' menu -- which includes mother/daughter and father/son massages. Carnival's approach centers on "fun" (as opposed to, say, "luxury," "serenity" or other buzzwords used by lines attracting cruisers sans children). Carnival Vista and the line's Dream-class ships (Magic, Dream and Breeze) offer some of the largest facilities in the fleet -- and for families, this translates to bigger spaces to play together and more family activities. On Carnival, parents, grandparents and children can enjoy scavenger hunts, karaoke (complete with a live band backup! ), comedy performances (family-friendly shows are available) and scheduled family activities within the kids' clubs, like ice cream parties. 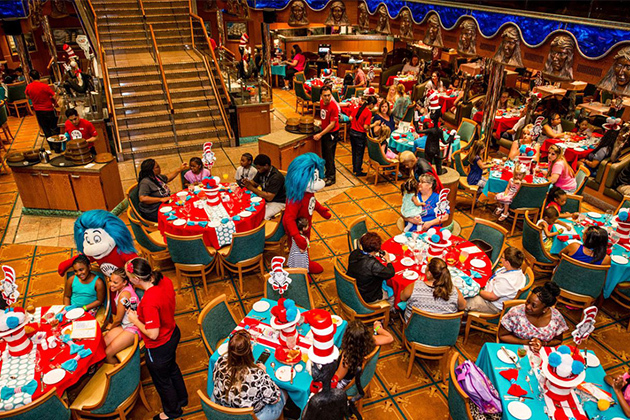 Carnival also has a "Seuss at Sea" program, perfect for toddlers and their parents; it includes a cute character parade, interactive story time and a breakfast of green eggs and ham. Team up with the family to win prizes in "Hasbro, The Game Show" onstage in front of a live audience. See a show at the Towel Animal Theater, where the adorable towel creatures from your stateroom come to life onstage; kids can even learn how to make them at a towel-folding seminar. Further, families can create customized furry pals at the first Build-A-Bear workshop at sea, which will be available fleetwide by summer 2017. A mother-and-daughter manicure, anyone? How about a father-and-son foot massage? Carnival offers a youth spa program called ZSPA where children (ages 12 to 17) and their parents can enjoy body and beauty treatments together. Families can also find classes on everything from cooking and dancing to scrapbooking. Carnival's newer ships offer a ton of outdoor recreation options for families. These include Carnival's WaterWorks water park, with racing slides and a splash area for tots; SportSquare, a fitness area with a ropes course, Ping-Pong, foosball and mini-golf; and (on Vista only) SkyRide (think bicycle meets zipline). There's also a 3D theater (Carnival Breeze and Vista only) and IMAX theater (Vista), movies at the pool and stage shows that are high-tech and not overly long. To ratchet things down a bit, families can check out books from the library to read together on all Carnival ships, borrow board games to play on deck or even participate in a murder mystery show. Royal Caribbean has been promoting family activities for years now, and their ships are a great option for families with kids of all ages, particularly those who enjoy participating in outdoor activities and sports together. Family programming is offered on all ships, year-round, with the Oasis-class and Quantum-class ships providing the most options. Imagine 4-year-olds strutting their moves along with their 40-year-old moms at the disco, an opportunity they probably don't otherwise have outside of family weddings. Yes, you'll find the solid standbys like karaoke, scavenger hunts and outdoor movies, but where Royal Caribbean really shines are in family sports tournaments, pool games and active challenges. For families that enjoy games (and competition for the sake of silliness), there are a variety of game shows and trivia contests, as well as onboard parties that take place in Studio B. Parents and kids can also take cooking or dance classes together, learn the art of cupcake decorating, take in a fashion show or help solve a crime at the mystery dinner theater. 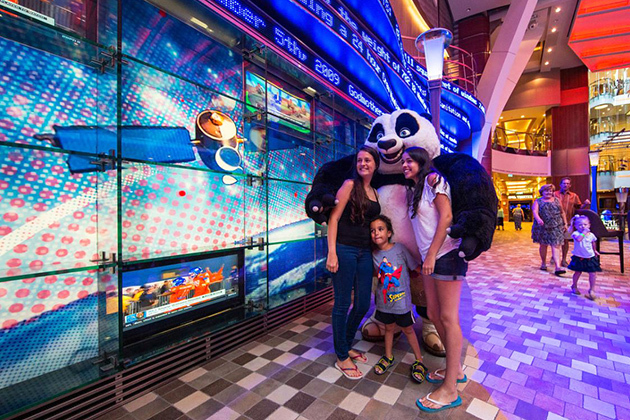 Several of Royal Caribbean's ships offer the DreamWorks Experience, a chance to interact with characters from Shrek, King Fu Panda, Madagascar and other DreamWorks features while onboard. While the character angle may seem to cater more to little kids, DreamWorks characters have a broader appeal than most. There are shows, parades, character meals and meet-and-greets, and popular DreamWorks movies play in the theater. Onboard theatrical productions such as "Mamma Mia!" and "Grease" make for fabulous family evenings. The ice skating show is a must, and the performance in the AquaTheater (Oasis, Harmony and Allure of the Seas) will delight the entire family with synchronized swimming, acrobatics and high diving. Parents of little ones will love the black-light ImagineOcean! puppet show, and cruisers of all ages will enjoy the 3D theater. Royal Caribbean's family-friendly amenities are no longer limited to ice rinks and rock climbing walls. Their newest ships continue under the assumption that bigger is better. Oasis-class ships have multiple pools and hot tubs, mini-golf, surf simulators and a zipline -- all great for fostering some serious outdoor togetherness. Heading indoors, you can hang out at the family disco, ice skate together in Studio B or take in a parade. The new Quantum-class ships take things to greater heights, literally, with a new skydiving simulator, bumper cars and rollerskating, as well as North Star, a sightseeing "capsule" that extends out on a giant arm 300 feet over the ocean. Norwegian's relaxed atmosphere has always made it appealing to families, and newer ships have added an increasing number of activities and spaces for families looking to spend time together onboard. Family programming is offered on all ships, with the best options being Norwegian's Epic, Breakaway, Getaway and Escape. One of Norwegian's greatest successes is in providing terrific family entertainment. Priscilla Queen of the Desert is a fabulous family-friendly production that has plenty of dance tunes from the 70s and 80s. Breakaway's Rock of Ages-themed deck party (who can't get down to Madonna and Quiet Riot?) is a blast for all ages and ends in a fireworks display. Other activities that foster family togetherness include pizza-making lessons, deck parties, family charades, cupcake decorating at Carlo's Bakery, glow paint dance parties and family movie nights. Active families will be in heaven on Norwegian. 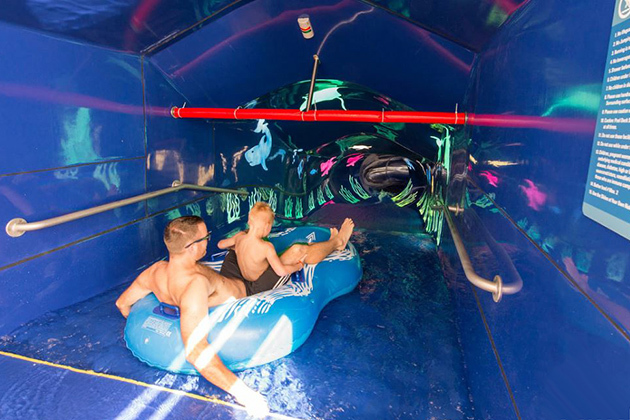 Escape features the largest ropes course at sea in addition to the largest water park at sea, and parents and kids can shoot down a thrilling water slide side-by-side on the tandem Aqua Racer. All four ships, in fact, have elaborate water parks -- Epic's features multiple slides, including a 303-foot-long corkscrew tube, and the Drainpipe, a 104-foot tube that empties into a giant funnel. Breakaway and Getaway have five multistory water slides and a three-story sports complex with an ambitious ropes course and mini-golf. Norwegian Epic has rock climbing and rappelling walls, a climbing cage and bowling alley. And poolside games and challenges are scheduled on all cruises and are fun for the whole family. 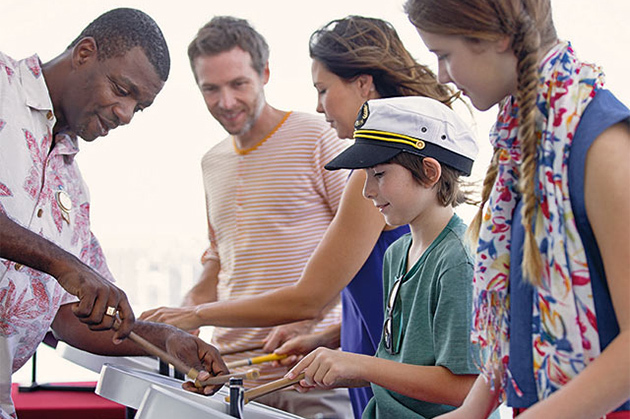 Princess is upping the ante when it comes to offering family activities onboard its ships. While its kid-friendly options might not be as omnipresent as on Disney or Royal Caribbean, the cruise line is a great choice for families looking for a slightly more low-key, mature family environment. For this reason, Princess holds great appeal for multigenerational groups traveling together. Royal Princess and Regal Princess offer the most amenities and programs. Princess is a great choice for families looking to get away from the typical character-driven, brand-heavy activities found on other family-friendly lines. No Disney or DreamWorks events here, but the line does have a partnership with Discovery Channel, and passengers will find Discovery Channel-themed activities and excursions -- such as Shark Week at Sea -- on select sailings. Other activities on the line include parent-child scavenger hunts, trivia contests and karaoke. As on many other ships, families can take in poolside movies, sporting events and concerts on a giant outdoor screen via Movies Under the Stars-- but on Princess the experience comes complete with blankets, popcorn, cookies and milk. The ships' TV studio, Princess Live!, hosts interactive cooking shows, singing competitions, game shows and a murder mystery; in the larger Vista Lounge, you'll find comedians, illusionists and musicians performing; and look for evening live music and an end-of-cruise balloon drop in the Piazza. Families looking to get their game on will find plenty of opportunities for outdoor fun with basketball, volleyball, bocce and Ping-Pong. Active families will love the batting cage, laser shooting range and driving range on Royal Princess and Regal Princess, as well as the large pool decks with poolside cabanas. In the evening, the top deck pools host an interactive sound and light show with dancing fountains that shoot water up to 33 feet into the air.